But does it need to be? Rich Homie Quan isn't the only one out there feeling some type of way. Picture the scene: Christmas morning, 2013. My wife, daughter, and I are in the living room, unwrapping presents. the Disney Parks Christmas Parade is on - it's not an annual parade tradition, but we tuned in specifically knowing that Carolina Crown would be performing. The feed shifts to Nick Cannon, in Disneyland, to introduce the next group, which will be performing across the country in Walt Disney World. As he begins his introduction, he refers to Carolina Crown as an "award-winning marching band". It was as though I could hear the screams from fellow band nerds nationwide. I'm sure it didn't help matters that the vile phrase was uttered by the star of Drumline; Hollywood's only marching band-based movie remains polarizing among those in the marching band community. But the fact remains: Whenever a drum corps is referred to as a marching band, many of us recoil as though someone used a non-PC term or worse, a slur. I'm not saying I don't understand the reaction. It wasn't long ago I would have it myself, and I'd be lying if I said I didn't internally cringe just a little, if only out of empathy. But when we get on our high horse like this, we don't do ourselves, or the activity, any favors. The way I see it, the fanatical insistence stems from one of a couple of things. One is, if I may be blunt, an inferiority complex. An overwhelming majority of drum corps fans who don't like the association are members of marching bands themselves. Somewhere, anecdotally or through personal experience, they have been led to view marching band as "less than" - not a worthwhile experience, something that draws at best indifference and at worst ridicule. There is a desire to disassociate the summer activity from that negative connotation - the rock stars, superheroes, and gods who march DCI (and to be clear, while they aren't the only drum corps game in town, that is nearly exclusively what many mean when they say drum corps) couldn't possibly be in something as common as a "marching band" - although nearly all are. The second reason is nearly the opposite: Exclusivity and elitism. As drum corps fans, we use the term "drum corps" - and the knowledge not to call it a marching band - as a shibboleth to denote an insider of the activity. If someone gets it wrong? Well it tells us they don't know, don't belong, or are worthy of mockery. The problem with this is that as much as we preach "grow drum corps," this is a horrible way to get casual fans involved in the activity. Those who aren't closely engaged will make this mistake - and to be clear, it's really not a mistake - and in our "correcting" we may very well turn them off from the activity. After all, there's a decent chance that being a fan of or a part of marching band is why they are familiar with drum corps in the first place (was it for you?) and suggesting that it isn't either breaks the connection with their interest, or worse, makes them think that drum corps fans aren't the type of people they care to be around. What's more, the honest truth is that marching band is a household term. Drum corps isn't. How do you get people involved when you distance yourself from your closest relative and dearest ally? 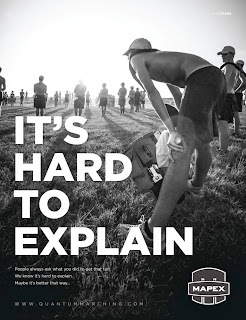 As the Quantum Marching ad above quips: "It's hard to explain." 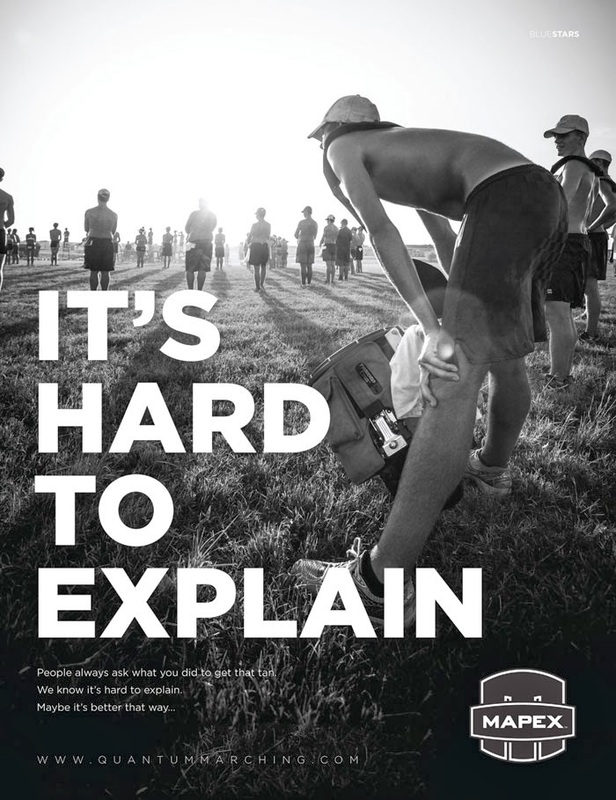 While it can be difficult to express drum corps to those who are previously unfamiliar, I'd argue it's only as hard as you choose to make it, and if you choose to hamstring yourself by refusing to say "marching band", You're not doing yourself any favors. Is there a difference? In a lot of ways, yes, mostly qualitatively, but the simple truth remains: Drum corps are marching bands. If you don't want them used interchangeably, do your part by not doing it yourself, but understand that not everyone loves it like you love it. More importantly, do whatever you can to help make sure that the average person does know what drum corps is - even if they call it a marching band.